A few months ago, we told you about K’Hairi, a 7-year-old boy who suffers from sickle-cell and asthma and asked Santa Claus for one thing every Christmas — for his mother to have a decent place to live. 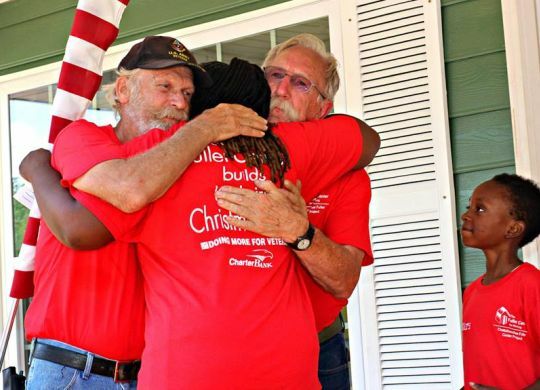 A couple of weeks ago, we told you about that wish coming true in earnest as volunteers began raising the walls on a new Fuller Center home for K’Hairi and his mom — Army veteran Carla Ross — in West Point, Georgia, at the start of a two-week blitz build that brought the community together in ways they will never forget. Today, we are sharing a video we received from our friends at the Chattahoochee Fuller Center Project featuring the dedication ceremony for their 37th house. Congratulations to Carla Ross, K’Hairi, CFCP Executive Director Kim Roberts, house leaders Tim DuBois and Charlie Thell, West Point Mayor Steve Tramell, and the many other volunteers and supporters who came together to make this project possible!